This is what I want to see when I look out my living room window. That's the goal. 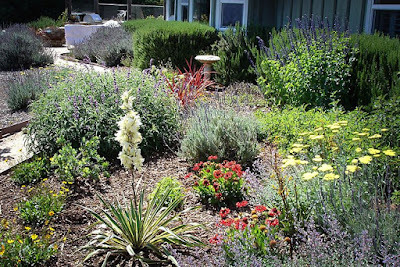 Hopefully, in the next couple of weeks, we will be installing our fence in the front yard - and start our landscaping. I am at the stage, where I am fed up with our yards - victims of our 3-year drought. 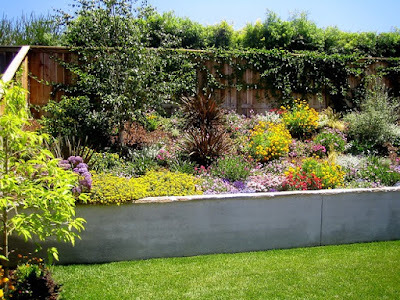 Everyone is doing some kind of landscaping - from expensive and professional to DIYers and cheap. We are in the latter. We will do it ourselves because let's face it - I have other things I would prefer to spend my money on. Like maybe a vacation, this year? I do not want a front lawn - My husband wants a small patch of it. WHY? So when we are sitting out there, it is pretty, green and comfortable for our dog to lay on. 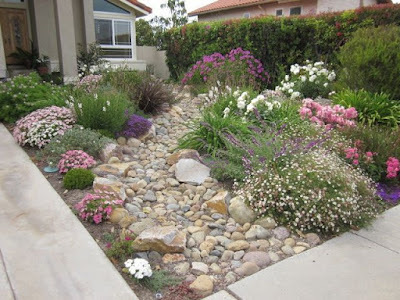 I want rocks and pretty drought-resistant bushes, and stepping stones. If I need more color, I can plant flowers in pots and display them. 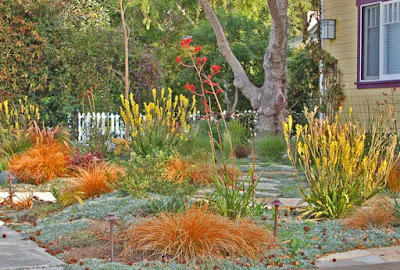 I also want a yard that is a habitat for the birds. We have a problem hill in our back yard. This would work. and that's a blog post for the future. Drought. That almost sounds inviting as I look at a two-week weather forecast and see rain for ten days. I have lots of drought tolerant plants in the yard so that I do not have to waste water on them. Yesterday I decided to get rid of a large swath of grass which means I have another project to complete in between the rain days. This place is a swamp right now. I do all my own gardening. It is very therapeutic. Good luck with yours.